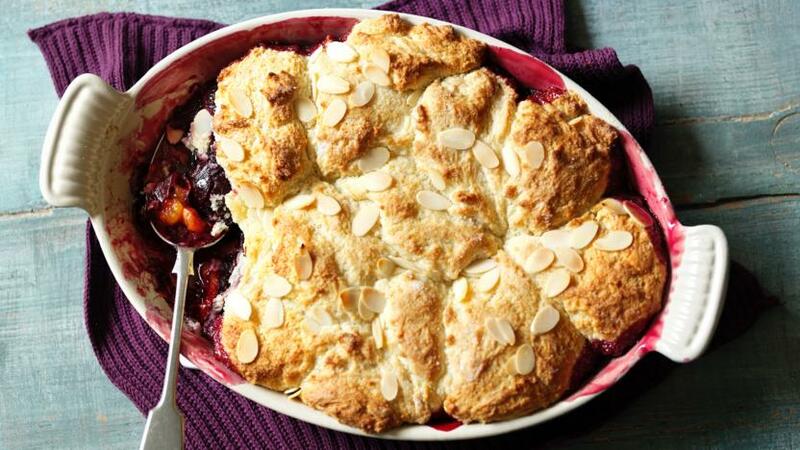 Rick Stein uses a food processor to whizz together the topping for his sticky damson cobbler – it's up to the oven to do the hard work. Spread the damsons over the base of a 2 litre/3½ pint shallow ovenproof dish and sprinkle with the caster sugar. Preheat the oven to 190C/375F/Gas 5. Sift the flour, baking powder, the 100g/4oz of caster sugar and a pinch of salt into a bowl or a food processor, add the butter and work together until the mixture looks like fine breadcrumbs. Break the egg into the buttermilk and beat together well. Add to the dry ingredients and mix together lightly into a soft, sticky dough. Drop walnut-sized spoonfuls of the mixture over the top of the damsons, leaving a little space between each one, then sprinkle with the flaked almonds and the remaining 1 tbsp of sugar. Bake in the oven for 30-35 minutes until golden and bubbling, covering it loosely with a sheet of foil if it is browning a little too quickly. It is done when a skewer, pushed into the middle of the cobbler topping, comes away clean. Leave to cool briefly before serving with some custard, double cream or crème fraîche.